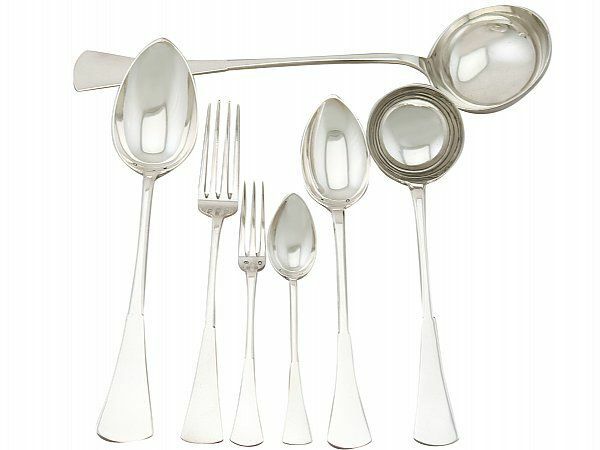 The pieces of this exceptional vintage Hungarian silver canteen of cutlery for six persons have been crafted in a plain tapering form. The plain handle of each piece features a chamfered edge to the shaft and broad swept terminal, all in the Art Deco style. This service can be purchased with associated knives if so desired, for further information please contact Andrew Campbell directly at enquiries@acsilver.co.uk. * This variation of the Dianakopf mark was used for Hungarian silver after 1937; this mark, in addition to the style, determines the date of this service as circa 1950. This vintage silver flatware service is an exceptional gauge of silver, exceptional quality and in exceptional condition. The Hungarian hallmarks struck to each bowl and heel, and the reverse of each ladle are all very clear.